For all of India's myths, its sea of stories and moral epics, Indian history remains a curiously unpeopled place. 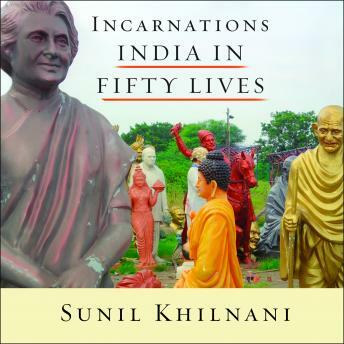 In Incarnations, Sunil Khilnani fills that space, recapturing the human dimension of how the world's largest democracy came to be. His trenchant portraits of emperors, warriors, philosophers, film stars, and corporate titans-some famous, some unjustly forgotten-bring feeling, wry humor, and uncommon insight to dilemmas that extend from ancient times to our own. As he journeys across the country and through its past, Khilnani uncovers more than just history. In rocket launches and ayurvedic call centers, in slum temples and Bollywood studios, in California communes and grimy ports, he examines the continued, and often surprising, relevance of the men and women who have made India-and the world-what it is. We encounter the Buddha, 'the first human personality'; the ancient Sanskrit linguist who inspires computer programmers today; the wit and guile of India's Machiavelli; and the medieval poets who mocked rituals and caste. Incarnations is an ideal introduction to India, and a provocative and sophisticated reinterpretation of its history.